Is the landlord required to make improvements to the property? Will the tenant receive any signing incentives? What are Landlord Improvements?Landlord improvements are extra work done to the property by the landlord that enhances the property usually before the tenant moves in. It can include something simple like putting on a new coat of paint to complex renovations of the property.What are signing incentives?Signing incentives are bonuses the landlord gives to the tenant, typically for signing a fixed term lease. They may include free month's rent, or a rent reduction for the initial months of the fixed term tenancy. If the tenant breaches the lease, these incentives may have to be paid back to the landlord.How to describe improvements?You should be specific as to what is to be done, the quality of materials and workmanship as well as when it needs to be completed. This document preview is formatted to fit your mobile device. The formatting will change when printed or viewed on a desktop computer. This residential lease (the "Lease") is dated , and is between _________________________ (the "Landlord") and _________________________ (the "Tenant"). The Landlord agrees to rent to the Tenant the house, municipally described as ______________________, ______________________, Virginia __________ (the "Property"), for use as residential premises only. No guests of the Tenants may occupy the Property for longer than one week without the prior written consent of the Landlord. No animals are allowed to be kept in or about the Property without the revocable written permission of the Landlord. Subject to the provisions of this Lease, the Tenant is entitled to the use of parking on or about the Property. The Tenant and members of Tenant's household will not smoke anywhere in the Property nor permit any guests or visitors to smoke in the Property. The term of the Lease commences at 12:00 noon on April 20, 2019 and ends at 12:00 noon on April 20, 2019. Subject to the provisions of this Lease, the rent for the Property is $___________ per month (the "Rent"). The Tenant will pay the Rent on or before the ____________________ of each and every month of the term of this Lease to the Landlord at ______________________, ______________, ______________________ __________ or at such other place as the Landlord may later designate by cash or check. affixing to or erecting upon or near the Property any radio or TV antenna or tower. The Tenant is hereby advised and understands that the personal property of the Tenant is not insured by the Landlord for either damage or loss, and the Landlord assumes no liability for any such loss. In the event that any action is filed in relation to this Lease, the unsuccessful Party in the action will pay to the successful Party, in addition to all the sums that either Party may be called on to pay, a reasonable sum for the successful Party's attorney fees. This Lease will be construed in accordance with and exclusively governed by the laws of the Commonwealth of Virginia. If there is a conflict between any provision of this Lease and the Act, the Act will prevail and such provisions of the Lease will be amended or deleted as necessary in order to comply with the Act. Further, any provisions that are required by the Act are incorporated into this Lease. The invalidity or unenforceability of any provisions of this Lease will not affect the validity or enforceability of any other provision of this Lease. Such other provisions remain in full force and effect. This Lease may only be amended or modified by a written document executed by the Parties. The Tenant will not assign this Lease, or sublet or grant any concession or license to use the Property or any part of the Property. Any assignment, subletting, concession, or license, whether by operation of law or otherwise, will be void and will, at Landlord's option, terminate this Lease. If the Property should be damaged other than by the Tenant's negligence or willful act or that of the Tenant's employee, family, agent, or visitor and the Landlord decides not to rebuild or repair the Property, the Landlord may end this Lease by giving appropriate notice. The Tenant will promptly notify the Landlord of any damage, or of any situation that may significantly interfere with the normal use of the Property or to any furnishings supplied by the Landlord. The Tenant will not engage in any illegal trade or activity on or about the Property. The Parties will comply with standards of health, sanitation, fire, housing and safety as required by law. The Parties will use reasonable efforts to maintain the Property in such a condition as to prevent the accumulation of moisture and the growth of mold. The Tenant will promptly notify the Landlord in writing of any moisture accumulation that occurs or of any visible evidence of mold discovered by the Tenant. The Landlord will promptly respond to any such written notices from the Tenant. If the Tenant is absent from the Property and the Property is unoccupied for a period of 4 consecutive days or longer, the Tenant will arrange for regular inspection by a competent person. The Landlord will be notified in advance as to the name, address and phone number of the person doing the inspections. At the expiration of the term of this Lease, the Tenant will quit and surrender the Property in as good a state and condition as they were at the commencement of this Lease, reasonable use and wear and tear excepted. The Tenant will obey all rules and regulations of the Landlord regarding the Property. Housing built before 1978 may contain lead based paint. Lead from paint, paint chips, and dust can pose health hazards if not taken care of properly. Lead exposure is especially harmful to young children and pregnant women. Before renting pre-1978 housing, lessors must disclose the presence of known lead-based paint hazards in the dwelling. Lessees must also receive a federally approved pamphlet on lead poisoning prevention. All monetary amounts stated or referred to in this Lease are based in the United States dollar. Any waiver by the Landlord of any failure by the Tenant to perform or observe the provisions of this Lease will not operate as a waiver of the Landlord's rights under this Lease in respect of any subsequent defaults, breaches or non-performance and will not defeat or affect in any way the Landlord's rights in respect of any subsequent default or breach. This Lease will extend to and be binding upon and inure to the benefit of the respective heirs, executors, administrators, successors and assigns, as the case may be, of each Party. All covenants are to be construed as conditions of this Lease. All sums payable by the Tenant to the Landlord pursuant to any provision of this Lease will be deemed to be additional rent and will be recovered by the Landlord as rental arrears. Where there is more than one Tenant executing this Lease, all Tenants are jointly and severally liable for each other's acts, omissions and liabilities pursuant to this Lease. Locks may not be added or changed without the prior written agreement of both Parties, or unless the changes are made in compliance with the Act. The Tenant will be charged an additional amount of $__________ for each N.S.F. check or checks returned by the Tenant's financial institution. Headings are inserted for the convenience of the Parties only and are not to be considered when interpreting this Lease. Words in the singular mean and include the plural and vice versa. Words in the masculine mean and include the feminine and vice versa. This Lease may be executed in counterparts. Facsimile signatures are binding and are considered to be original signatures. This Lease constitutes the entire agreement between the Parties. During the last 30 days of this Lease, the Landlord or the Landlord's agents will have the privilege of displaying the usual 'For Sale' or 'For Rent' or 'Vacancy' signs on the Property. Time is of the essence in this Lease. IN WITNESS WHEREOF _________________________ and _________________________ have duly affixed their signatures on this . The Tenant acknowledges receiving a duplicate copy of this Lease signed by the Tenant and the Landlord on the _____ day of ______________________, 20____. MOLD DISCLOSURE: There are many types of mold. Inhabitable properties are not, and cannot be, constructed to exclude mold. Moisture is one of the most significant factors contributing to mold growth. Information about controlling mold growth may be available from your county extension agent or health department. Certain strains of mold may cause damage to property and may adversely affect the health of susceptible persons, including allergic reactions that may include skin, eye, nose, and throat irritation. Certain strains of mold may cause infections, particularly in individuals with suppressed immune systems. Some experts contend that certain strains of mold may cause serious and even life-threatening diseases. However, experts do not agree about the nature and extent of the health problems caused by mold or about the level of mold exposure that may cause health problems. The Centers for Disease Control and Prevention is studying the link between mold and serious health conditions. The seller, landlord, seller's agent, buyer's agent, or property manager cannot and does not represent or warrant the absence of mold. It is the buyer's or tenant's obligation to determine whether a mold problem is present. To do so, the buyer or tenant should hire a qualified inspector and make any contract to purchase, rent, or lease contingent upon the results of that inspection. A seller, landlord, seller's agent, buyer's agent, or property manager who provides this mold disclosure statement, provides for the disclosure of any prior testing and any subsequent mitigation or treatment for mold, and discloses any knowledge of mold is not liable in any action based on the presence of or propensity for mold in a building that is subject to any contract to purchase, rent, or lease. The Tenant ACKNOWLEDGES receipt of the information contained in the above Landlord's Mold Disclosure. A lease is a contract a landlord and tenant sign when a tenant wants to rent commercial or residential property. A Residential Lease Agreement is a lease agreement that is specific to residential rental properties and is used to outline the terms and conditions of a tenancy, including the rights and obligations of the landlord and tenant. It can be used for various types of residential properties, including apartments, houses, condos, duplexes, townhouses, and more. To rent commercial property, use LawDepot's Commercial Lease Agreement. 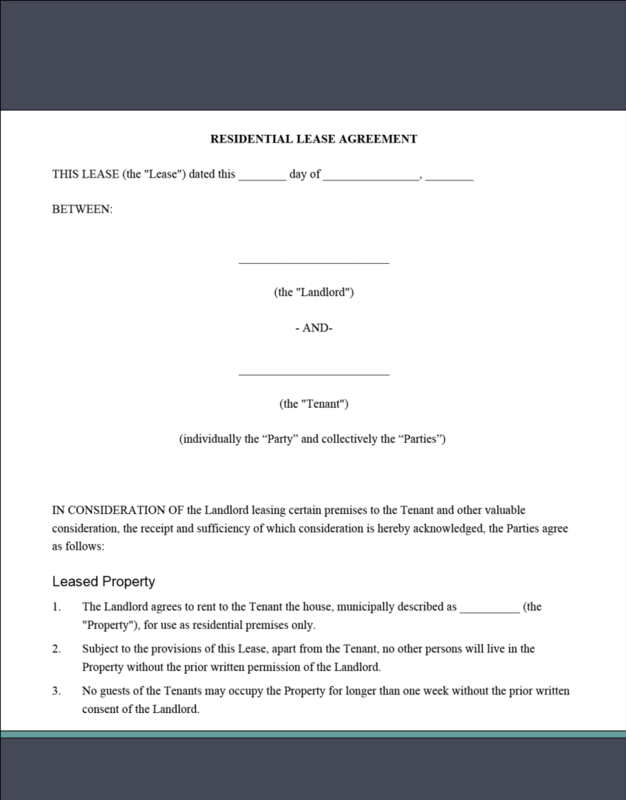 What is included in a Residential Lease Agreement? Landlords using LawDepot's Residential Lease have the option of using a standard or comprehensive agreement. Both the tenant and the landlord should keep a copy of the signed agreement for their records. Who needs a Residential Lease Agreement? When entering into any type of residential rental circumstance, you should ensure that you have a valid contract to outline your rights and responsibilities as a landlord or a tenant. Should my lease end on a set date? Before creating a lease agreement, landlords need to decide whether they want the lease to end on a set date or not. A lease with a predetermined end date, usually called a fixed term lease, is when the tenant agrees to rent the property for a certain period of time at a fixed price. This type of lease uses calendar dates to specify the start and end of the lease. At the end of a fixed term lease, the landlord and tenant can sign a new lease with updated dates and information or move on. A lease without an end date, usually called a periodic tenancy or automatic renewal lease, is when the lease automatically renews after a certain duration (for instance, every month, six months, or year). With this type of lease, the landlord and tenant rent until one party provides appropriate notice signifying they want the lease to end. Both types of leases carry their own advantages and disadvantages, depending on the situation in which they are used. How do I rent a room in my house? Using a Lease Agreement, landlords can specify that they are renting out a room as opposed to an entire unit. With a room rental lease agreement in place, landlords can be sure tenants understand their rights and obligations, including how much rent is, when it is due, what areas of the property they can access, and more. Because landlords and tenants occupy the same premises, it is important that landlords discuss boundaries and expectations at the start of the tenancy, such as when a landlord can legally enter the tenant's space, what house rules are in place and how they will be enforced, how guests will be handled, and more. What does it mean to rent-to-own? Rent-to-own, sometimes called option to purchase or lease-to-own, is when a tenant is provided the opportunity to purchase the rental property from their landlord. For this type of agreement, a renter pays a non-refundable option fee and in return the landlord provides the renter an option to purchase the home at a predetermined price. If the tenant decides not to purchase the property, the landlord keeps the option fee. Often, an option to purchase in a lease is used when a landlord wishes to sell a home or unit but the potential tenant does not qualify for a lender-based mortgage for reasons such as the tenant has a poor credit score or is unable to pay the full amount for a deposit. What Are My Rights as a Landlord? What is Renting to Own? Personalize your Residential Lease template. Print or download in minutes. Ready to create a Residential Lease Agreement for your rental property? ©2002-2019 LawDepot® (Sequiter Inc.). All Rights Reserved. LawDepot® is not a law firm and cannot provide legal advice. ©2002-2019 LawDepot® (Sequiter Inc.). All Rights Reserved. LawDepot® is not a law firm and cannot provide legal advice. Note: Your initial answers are saved automatically when you preview your document. This screen can be used to save additional copies of your answers. Check to hide this tip in the future.